We visited Hawaii back in January, 2019. We really liked the condo. It was very clean, spacious and well situated. It is right on the bay and within walking distance to the beach. We had a great time. The view was fantastic! Great location. Had everything we needed. Would definitely stay again!! Our recent stay in unit 1294 was very comfortable. The marina/ocean view is wonderful - what a treat to wake up to it each morning. The sunsets were also gorgeous! The king size bed is great, appliances in the kitchen work well and it is a great location for visits to the Waikiki beach or Ala Moana park. This our third (fourth?) stay at this unit and it truly feels like home to us. The owner provides everything you need (plenty of towels, spare pillows/blankets, cleaning supplies), as well as a comfy couch and chair in the family room. There's tons of storage for your stuff, and the views are spectacular. This is our top choice when traveling to O'ahu to visit family. I've stayed in this building about 6 times, this specific condo twice (it wasn't available the other dates) or I would have stayed every time. For me the building is located in the perfect spot, not in Waikiki proper but very convenient for getting around on foot or by vehicle. I love this condo for several reasons. It's on the 12th floor so it's up high enough not to hear street noise. I don't think there is a better view in all of Honolulu, don't miss the fireworks from the balcony on Friday nights. The condo is very clean, bright and comfortable, the beds, the furniture, etc. It's very well stocked with extra bedding, bathroom and kitchen supplies (not the case in all the units). I usually stay with my adult daughter and we have plenty of space and privacy. The unit has been remodeled and was beautifully done. A small thing that makes a huge difference is there are a couple of sets of keys, which makes a difference. I really enjoy staying in this unit, its my first choice when staying on Oahu. Loved everything about this place. Located on end of building on the 12th floor. Nicely furnished and clean ! Loved the view of the marina below !!! We could not have found a better Condo than this.The bedroom and balcony overlooks the harbour. The kitchen is fully equipped, everything was very clean and comfortable. No noise allowing us to have a good nights sleep. Views are beautiful and on Friday there is a firework show which you can see from your balcony. The beach is only a 5 minute walk and if you continue to walk along the beach you will find shops, bars and restaurants. When you exit the Condo turn left where there is the Red Lobster restaurant, McDonald's, Subway and a small grocery shop for bread, milk, cereals, whatever you want. The large shopping centre is a 5 minute bus or car ride. We caught the bus (by traffic lights) to Diamond Head, worth a visit and Pearl Harbour. We purchased a day bus pass for $5.50 per adult as we did not have a car. There is a car park on site $28 per day. We loved staying here and will return again next year. I would highly recommend this Condo. We have stayed at a few units at the Ilikai Marina and this is our favorite. You can read other reviews of other Ilikai Marina units for feedback on location, parking, surrounding area, etc. I'd like to talk about this specific unit. EVERYTHING you need for a relaxing stay is right here. We love that this unit has so many things we enjoy in our home - fans, powerful AC, fast WiFi, comfortable bed, lots of towels and an ice maker in the fridge. I grew up on Oahu and we use this place as a home base when visiting family. We can't wait to come back. Great place to stay! Very comfortable and clean. Had all the amenities we needed. Close to shopping, car rental, restaurants and water activities. Great views! We will definitely stay here again! Thanks to the owners! There is much to like about 1294 but a few suggestions to make things better:Because there is NO dishwasher, dishwashing supplies need to be provided... including a dish drainer, presently there is only one dish towel. Better lighting throughout and more accessible outlets (for mobile phones, etc.) are needed. An apartment size washer/dryer as provided in most condo rentals would be an improvement over the small, communal laundry on the 8th floor. Thank you for your comments. I agree you should have had a dish drainer and don't know why it wasn't there. Extra dish towels are not an issue with us. There are many good space reasons in a small condo not to have a dish washer. The same goes for a washer and dryer. There is plenty of electrical outlets in the condo and I am surprised you couldn’t find them. I am proud to say we designed the condo to be our second home and very pleased to offer it as it is. I am surprised you didn't appear to enjoy the beautiful view and location enough to comment on them. Great location, & a quiet, very well maintained condo. Unit is a little dark & small but adequate, & furnishings are very nice. Could use some new pillows on the bed & more light in dressing area. Food storage & counter space is a real issue. There are no cabinets available after grocery shopping. Overall we were very satisfied & had a wonderful time. A superior condo. Great layout, premium finishes, top of the line Hawaiian style furniture, super mattress king bed. A view of the marina and sunset beyond description. Fully equipped kitchen, upscale appliances. Plenty of dishes, pots, pans and every utinsel imaginable. No negatives.Truly a 5 star unit. This was our first time in Hawaii and this was a fabulous vacation rental. The view of the marina/ocean/Friday night fireworks was awesome!The location is great. Easy access to the beach and lagoon, many restaurants are in walking distance and the mall is very close. We used the pool next door once and it was very nice.We made many meals in the condo and it’s equipped with everything you need. The king size bed is comfortable, but the pullout couch could use an upgrade. The laundry room ($5 in quarters for a load) on the 8th floor and parking in the building ($20/day) we’re convenient. We had a great time here and would rent again! Thanks for sharing your place! My wife and I enjoyed staying at the condo it had a wonderful view on the 12th floor of the ocean and marina. I felt we had front row seat of the Hilton fire works display on Fridays. This area was quiet compared to downtown Waikiki by far. The condo was clean and comfortable with small detail needed to better clean the tub but quick response to re-clean was offered. The vanity area to apply make up lacked some lighting. Need quarters to do any laundry on 8th floor I obtained at ABC across the street. We enjoyed walking at the Magic Island park in the morning which is on the ocean side and also walking the Waikiki beach area. The walk was short to the Ala Moana mall with many shops. Don Quijote super market had everything a person could want about 15 minute walk. This was a great vacation condo. Just about everything you could ask for is present. Great views of the ocean and sunset, perfect view for Friday night fireworks, short walk to the Ala Moana mall and beach area. Comfortable furniture very comfortable bed, good shower, nice appliances. Every thing worked fine, did not have to call maintenance one time. I’ve stayed in eight different condos in either the Ilikai hotel or marina and this rates right up at the top with the rest of them. I would definitely stay here again. Every condo has some minor negative but they are not even worth mentioning. Nothing that detracted or distracted from our stay. As I said, I would definitely stay here again. It was our first experience staying at a vacation condo, always staying at hotels. It was nice, 2 days. Gorgeous view of the ocean and marina. We enjoy going to our favorite restaurants. So we did not take advantage of the kitchen facilities. But it would have been perfect for a family or group that enjoys cooking while on vacation. The cancellation policy of 60 days is not conducive to our lifestyle. A lot can happen in 60 days. Thank you for the experience, the 2 days were fun! We have traveled all over the continental US and Europe, and your condo was perfect....The view of the Pacific was fabulous, the parking was very convenient, and the condo amenities were so comfortable. This was our first trip to Honolulu, and we have already voted on a return visit for the summer. We will be in touch to book with you again. As Advertised!!! And So Much More!!! My husband and I stayed in condo 1294 for 5 nights in November 2017. The condo was exactly as advertised. Often pictures of hotels/rentals look way nicer than the property really is but this unit did not disappoint. The elevators were easy to locate and pretty quick. No complaints. Walking down the hallway to the unit, you can smell cooking odors from other units and some noise but nothing that was over the top or bothersome. **It should be noted that once inside the unit we could not hear any noise from other units or smell anyone else's cooking odors. The unit is located at the end of the hallway right next to the room with the trash chute. Surprisingly there was no bad trash smells in the unit or hallway and we were not disturbed by other guests dumping their trash. The unit was very clean and well stocked. The full kitchen was well stocked and we were able to cook breakfast every morning and dinner a couple of nights with no problem. There were some pantry items like seasonings and cooking oil in the cabinet. These may have been left by other renters. There was dish washing liquid (no dishwasher). There was plenty of paper towels, toilet paper, towels, wash clothes, etc. We did bring our own soap and shampoo because we knew the hotel sized soaps wouldn't last 5 nights. The bathtub has jets but we didn't use it. There were instructions provided on how to use it if you chose. The water pressure and temperature were great. At first we thought the bed wouldn't be comfortable because it creaked a bit when we sat on it but we slept great each night. Extra pillows and blankets were provided. The living room couch was a pullout. We didn't use it but as a couch it was comfortable. There were plenty of hangers in the closet and we were able to hang up all our clothes. There was an iron and ironing board, a vacuum, hair dryers, a blow up mattress, and several other extras that I can't remember right now. We slept with no AC and the sliding door open. Fans are provided but we didn't need them. We did turn the AC on and shut the door when we woke up and as the day heated up. We watched the fireworks from the balcony on Friday night and enjoyed watching people surf and parasailing. The balcony is small but with the curtains pulled back and the doors open you can enjoy the view from the dining table or the couch or anywhere else (except the bathroom) for that matter. I'm trying to include all the things that I would want to know about this unit. Overall it was an excellent choice. No complaints. We were able to enjoy our vacation visiting family and at the same time be comfortable as if we were home. I'm so glad we chose Condo 1294 for our stay! Lovely View - Great Stay! My husband and I had a lovely time at this condo, and would be happy to stay again! It is central to so many things, great restaurants and shopping. The condo is decently equipped for cooking if you choose, and the listing is accurate. My only complaint is that it may be time for a new box spring. Turning over is a little noisy!Overall we were extremely happy with this condo! Thank you for sharing the condo with us . happy to stay there again . This condo is located close to great restaurants, great shoppping and Waikiki Beach. The condo is well equipped and has a wonderful full view of the ocean/marina. We really enjoyed watching the sunset from the balcony! I highly recommend. Things were clean and well stocked. The condo on the end at the 12th floor was quiet and the elevators efficient. Parking was easy and accommodationing. This is our second time staying at 1294. The furnishings are great and we love the big comfy bed but the main draw for us is the amazing view from the condo. I don't think there is a better value condo with this type of view. I laugh when others book hotels in Waikiki and pay more for non-ocean view rooms. The one thing I did wonder about was, the first time we stayed there was a whole gift basket of local treats left, as well as little travel sized shampoos, soaps, conditioners, and this time there were two chocolate covered Mac nuts and some bars of soap- is this no longer included? A note with the Mac nuts made it seem as if there should be more and they were forgotten. Not a big deal and wouldn't have expected it usually at a condo, only that we had had it the first time. The only other thing I would say could be changed is the lighting in the changing area/hallway between the bedroom and bathroom as I couldn't see things in my luggage because there was hardly any light in there. Anyway, still can't wait to return! What a great condo! Spacious (for Waikiki standards), modern, comfortable, and very clean. Everything we needed was there. The location was perfect, only a short walk from the beach, shops, restaurants, city bus stop (to many local attractions), car rental, and a grocery store. But best of all was the million dollar view! As soon as we walked through the front door, we were greeted by a rainbow over the marina (the same one, by the way, that the S.S. Minnow left from for it's 3 hour tour with Giligan and crew)! Seeing the sunsets from the lanai was magical. And watching the fireworks on the 4th of July - well, we couldn't have asked for a better seat! Mahalo for a wonderful stay in paradise! I struggled with this review as I hate to leave negative feedback. We booked this condo for three nights while staying in Honolulu. Prior to arriving, I thought I would check and see if it were possible to check in early. We always use VRBO and if we arrive early, I contact the owner to see if it's possible to get in early, knowing that most of the time you can't. Sometimes we have been able to do so though. I emailed Chuck a few days prior to arrival asking if it were at all possible for us to check in early and the curt reply I received set the tone for me. It were like a first impression. Chuck's reply was "Annie, check-in time is 3 PM. Wish we had a better answer for you." I was very much aware of the check in time. I personally thought he could have answered that a little better. I guess since he had my money, he didn't care if he were rude. A little area separated the bedroom from the bathroom which I had hoped to utilize to apply makeup, but the lighting was so terrible, I still had to go into the bathroom which didn't have any counter space. They could definitely add an extra light in that area. The pictures showed fireworks and if I'm not mistaken, the overview stated that you could see the fireworks from the lanai, but that was not the case. I don't know if maybe at one time you could as one reviewer said they saw them, but we did not. We heard them and walked out hoping to catch a glimpse of them, but did not see them. The internet never worked, which was frustrating. We always book a place with wifi so we can work while away. I emailed Chuck the day we arrived stating the message we were receiving and I'm still waiting on a reply from him. :-) I called the manager who was of no assistance either. She stated that whenever work was done in the building, it always went out. She told me to reset the modem which I did. It still didn't work. On the morning of check out, we realized we had no instructions. I immediately pulled up all the emails I had received and nothing stated what to do. We didn't know what to do as it was 5:30 AM so we didn't feel right calling the manager. We began opening and closing every cabinet and drawer we could find. We found a binder that had all the instructions. It actually would have been nice for it to have been out upon check in as it had some valuable information as well as directions for trash that we could not do. It said that trash had to be taken out. Well, the trash chute did not open until 7AM. We did the only thing we knew to do. We bagged it all up and set it outside the trash room. We were afraid of losing the deposit otherwise. I found that beyond aggravating. That binder should have been left out for us to find. We shouldn't have had to go searching for it. A cooler and some beach chairs would be a nice addition. Regretfully early check in was not available upon your arrival. A new modem was replaced in the unit for better internet access. The magnificent fireworks display seen from our lanai every Friday night is rated the most popular attraction from our guests. (well over 100) It’s very disappointing you did not enjoy our home the way we do. Our goal is to have all of our guests leave with the best possible Aloha experience possible. Thank you for taking the time to rate a response. Location was just a short walk to the beach which was nice. Having the Air Conditioning was nice since it was hot while we were there. Nice place! We were very pleasantly surprised at the unbelievable view of the boat harbor and beach/ocean. The condo was quite comfortable and well equiped. The location of the condo was also very good being close to water activities, dining, and shopping. We would certainly not hesitate to stay there again. Location was perfect. Condo was very clean and comfortable. Only disadvantage was no pool. Great location combined with an awesome view. This condo is located at the tip of Waikiki beach with a beautiful view. The view was of the Ala Wai Yacht Harbor, Magic Island, a small portion of Waikiki beach, and downtown Honolulu. It was a great view that included a lot of boat activity, including canoes, boats, and submarines.The condo was located near the beach and restaurants. With GPS, it was easy to drive from the airport to the condo and then anywhere you wanted to travel on the island. The condo was very spacious and well appointed. If we return to Honolulu, we would definitely try to rent here again. We've stayed at three different units at the Ilikai Marina and this is our favorite. It feels the most spacious because of the kitchen layout (no breakfast bar, which makes means the living room can accommodate a chair and ottoman plus a sofa), and because this unit actually is a foot wider than the non-end units we've stayed at. The location is great, parking is easy, and the unit has everything you need. This is the unit we will select from now on. Thanks for everything! We've used unit 1294 several times, it is well maintained, and furnishings are most pleasant. Foremost, the view is unbeatable, overlooking the marina, the expansive Pacific, with a great location.A cautious suggestion, would be for small folding chairs//stools for the Lanai area, utilization - please. We are so pleased you are a return happy guest. We have tried many ideas about small folding chairs on the lanai. We are prohibited from storing anything on the lanai. Folding chairs end up on the beach then back again in the condo full of sand. in addition, our guests really enjoy the ample storage space that would be reduced by storage of folding chairs. My wife and I take the bar stools out on the lanai an enjoy the spectacular sunsets and fireworks. Thank you for your feed back and look forward to your return. We were very pleased with the accommodation: convenient location, well-equipped, super clean, comfortable and quiet (aside from the occasional tour bus loading/unloading). We had NO problems at all. As to the A/C, we didn't use it at all - with windows open and ceiling fan, we had plenty of cross ventilation, but then we were lucky weather-wise.While we left before the Friday night fireworks, this would be the perfect location for a great view.Would we stay again? Certainly! We can't wait to return. Perfect location, great view, close to beaches, restaurants, & shopping. Also found numerous activities to take advantage of right in the marina area. We did Parasailing & underwater Scooter. The Condo is well supplied with all necessities. Parking rate is fair compared to what you'll pay at garages or shopping area of Waikiki. We come to Waikiki about every four years, the Chart House restaurant (not associated with chain) on first floor of Condo's building has always been a favorite, and really a very enjoyable place to dine. This was first time renting this Condo, and will do so again, and recommend to Friends & Family. Stayed at the condo for work and then later for play. The building is well placed, plenty of places close by to shop, eat, catch the city bus and has the best seat on the island for sunsets and the occasional fireworks display. Watching the marina is always interesting. The condo is at the end of the hall, which is quieter. Enjoyed it, I appreciate the amenities, time and money spent. Good times. What a beautiful place. My best friend and I stayed in your condo for the last 2 nights of our trip because we wanted a place that had a gorgeous view and a place that we could just sit and relax. This condo exceeded our expectations!!! We had gorgeous weather and even more beautiful sunsets. I would absolutely recommend this place to anyone wanting a place to just enjoy the view and some R & R. It is a little ways away from downtown and that is why we planned it for the last 2 nights. However, there are stores, beaches, hotels and other things to do around this condo also. I hope to be able to return one day!!!! Mahalo for such an incredible place to stay!!!! We had a fantastic stay at the Ilikai Marina in Waikiki. The apartment is perfect for 2 people - we never used the kitchen, but it was very well stocked. The bed was super comfortable and the views were amazing. Location was perfect - we used the bus several times from the bus stop right out front. The one and only thing that wasn't perfect was the AC in the condo - it got pretty hot and was hard to keep the place cool - the fans were great to help bring the temp down. We would stay here again and would recommend it to anyone staying on Oahu - it was the perfect place! Overall the stay was nice. Accommodations were as expected. The only minor things that would have made our stay even better was better lighting. All the lamps and overhead lights were dim and for seniors it was difficult to see detail. The air conditioner was also preset so when you wanted the air on unless it was set at that time it wouldn't come on. Also, if you wanted the air off and it was already set to be on it wouldn't shut off unless you opened the slider. I usually stay at Ala Moana Hotel for interisland business trips but they were filled and this condo turned out to be a very pleasant surprise and change of pace. Very nicely maintained and I would definitely stay there again. Very enjoyable and relaxing plus a superb view of the harbor. The Chart House restaurant on site was also quite enjoyable. Our stay in your condo was comfortable and the marina view spectacular. Location was great, and we found a gem of a restaurant in the hotel (Harbor Pub)! Thank you sharing your beautiful condo. We hope to return soon! My husband and I and our adult daughter stayed comfortably in this wonderful marina view condo. This location is simply the best. Right next to Ala Moana Park, wonderful walking all around Fort Derussy boardwalk and the Hawaiian Hilton lagoon. Buses run up and down Ala Moana Blvd for easy access to everything. Sunsets all year long from this side of the building. The unit is very nicely decorated and well equipped! All tile floors, comfy king bed + queen sofa bed, remodeled/updated kitchen & bath. You can tell this is not your standard vacation rental from the nice upgrades. Kitchen has everything you need for a shorter stay. We loved meeting and talking with some of the full time residents who were very friendly. Parking was easy to use, although an extra $20 per day. Directions were thorough and complete. We loved it and would highly recommend it - as an owner of several vacation rental properties - I'm very picky! Great position, everything that we needed - very clean and tidy. We were pleasantly surprised by this lovely, bright condo overlooking the yacht harbor. We were extremely comfortable and happy with the amenities provided. I highly recommend this property! On arrival - Easy access, everything was well organised and simple. This condo had everything I needed. The view is gorgeous, loved waking up every day to that vista, in my comfy bed on my own, heaven. Very quiet, great location and well priced.I shall return to this island paradise that is Hawaii and definitely stay here at Condo 1294 again. Many Thanks for a terrific stay! Second stay and plan to return! Love this condo. The view and location is amazing. Gorgeous ocean , park,marina and sunset views. Love watching the boats in the harbor and the Friday night fireworks from the lanai. Condo is very comfortable and quiet .Manager is accessible and quick to respond.You dont need to buy any drinking water as refrigerator dispenses filtered water. Would highly recommend this lovely condo. Our condo was very clean and comfortable. We loved having access to the bathroom from the bedroom AND from the livingroom since we had another couple with us. The door that separated the bedroom from the livingroom was very private. The only down we had on the condo was, we were not informed of having to have the sliding glass door closed to get the air conditioner working. It was very warm in the condo when we arrived and opened the sliding glass door to cool it off while we started the air conditioner. It wouldn't work. Luckily we had a large party staying in the condos and they were informed in their condo that the door had to be closed to run the air conditioner. We had a great time. Great views of beach and Marina a bit of a walk to get to action in Waikiki over all a good unite had everything you need for extended stay , had some problems with the a/c unite but I think it was thermostat related because it is a new a/c unite thermostat would keep going back to default setting of 84 after a couple hrs . Unite was as described and we would stay their again. We are pleased you enjoyed your stay. The unit just received a complete AC upgrade and the new operating instructions should solve the thermostat issues. Please note that the AC will automatically shut off when windows or sliding glass door is open. Mahalo and we look forward to your return. Very handy place to stay, clean and tidy everything you need. Great views. Mornings overlooking the marina and watching the waves crash and evenings watching the sun set over the ocean was just spectacular. Room was awesome and very accommodating. Having the kitchen was convenient, clean and well supplied. Would definitely be back and recommend for a wonderful vacation. 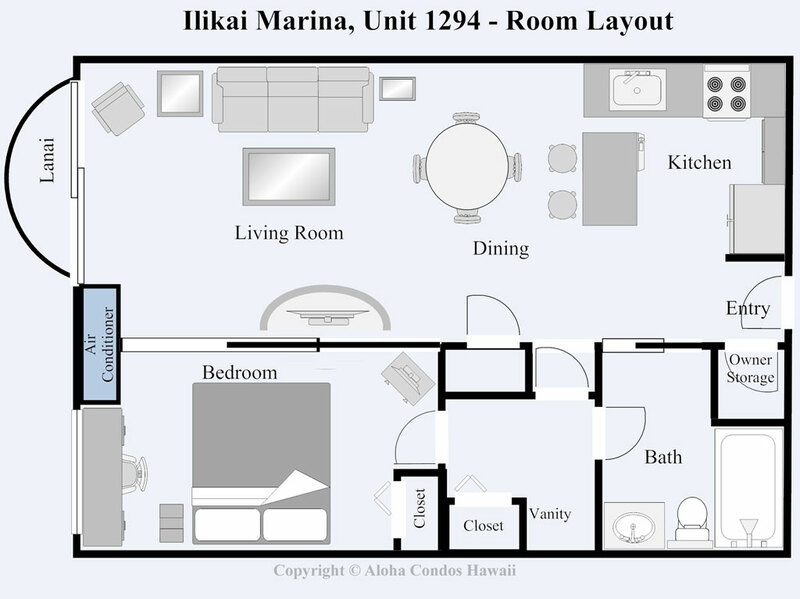 We enjoyed several days at the Ilikai Marina, Condo 1294. The condo is as advertised and as shown in the photos. View of the harbour is great. Parking is convenient ($20 a day) beds are comfortable, there are lots of towels and kitchen is well stocked. The location is convenient- walk the beaches, easy drive to Chinatown, Art Museum, Pearl Harbour and all Honolulu attractions. We were surprised by how quiet the condo was given the downtown location. Only suggestions - add a teapot/kettle for the tea drinkers and there were no hand towels in the kitchen to dry the dishes. Probably just an oversightThanks for a good start to our stay on Oahu. The lanai was too small, fumes from the traffic below were not good, the bathroom (sink & tub) were ackward, the lighting in the make-up area was poor, no dishpan, no zip lock bags. Plenty of towels, dishes & cookware was good, decor was "Hawaiian" & fun, appliances were good. Overall, it was about what we expected and the experience was livable. This was our second visit to Waikiki and the Ilikai condo was perfect for our one week stay. There were two of us and we felt like we had the perfect amount of space. Although the balcony was extremely tiny, it was nice to be able to open the sliding glass door and lookout over the water views. A small detail that was noticeable was the really soft toilet paper that was provided. Very nice touch! A couple of things to note are that there are some night activities down below so quite often we were awoken at around 2am or so to loud party people. The bed was very comfortable so I had no trouble falling asleep again. Also, learning how to work the shower was a bit of a puzzle. We had some interesting discussions about it and then resorted to the internet to figure it out. Once we figured it out, it was great. The parking felt a bit expensive but I believe it was one of the more affordable lots in the Waikiki area so I think it is the place to park if you are going to rent a car while staying at the Ilikai. It was also nice to see onsite security which makes it feel a bit safer than perhaps a place without. We would definitely consider staying here again. It met what our needs quite well. We had a quick four day stay and I was pleased with many things about this condo. The room is nicely decorated and has an updated kitchen and bathroom. The king size bed was comfortable and the heavy wood sliding wall kept the noise from the living room at an acceptable level. Also the bedroom had a great room darkening shade which worked wonderfully.It also has an extra dressing area with closet and area for getting ready which helped with only one bathroom. There is plenty of seating for our party of four also.Natalie, the property manager was available and was very helpful with the few things we needed help with. Also, the owner, Jim...was very nice when I called with a mix of little questions.Very nice view!!!!! Good location to the beach, shopping, and restaurants. Hawaiian Hilton Village has a great Luau and firework display and they are on the next block. Waikiki Beach is a quick walk away. There were only a couple things that I would suggest to the owners.There were no extra blankets for the pull-out sofa...plenty of pillows though.The extra dressing area has a great space to get ready in but is poorly lit. Has just one small strip light which isnt enough. There is a light up make up mirror but no stool to sit down at to use it. Had to get on my knees. Too old for that. LOLNo soap in the bathroom for washing our hands. Maybe a soap dish or hand soap would be nice as we didnt think to bring our own....so had to use shampoo. No biggy but just a small thing that would have been nice.Overall, very happy with this condo...Love that there is a security guard who is very attentive and made us feel safe. I highly recommend this very nice and very affordable property for your stay on Oahu!!!! We enjoyed the marina view above all else. The condo was very large, immaculate, with beautiful woodwork and upgraded jacuzzi bath and kitchen. Bedroom was very nice and plenty comfy; the sliding door we used to darken the room at sunrise yet it opened up the unit spaciously during the day. The double roller blinds gives the option for filtered light or blackout. Loved the folding floor sun screen which kept sun out of your eyes without sacrificing the view. The unit was unbelievably well stocked with everything one could ever need! Even the towels are first class. This was our first VRBO and we will definitely want to book the condo again. The area of town was better than we expected including a great local's bar and grill downstairs! And we enjoyed it more than our previous stay which was closer to the "main Waikiki" beachfront. It's a close stroll by street or by beach route or through through the park to everything there is to do in Waikiki. Thank you for sharing your incredible condo! Excellent facility for a couple or small family. Very close to shopping - Ala Moana Center - restaurants and beach. Well equipped with the necessities of home. Would like to have stayed longer. Definitely would consider this facility if we revisit in the future. The ocean views from this unit were really nice. The king bed was very comfortable and there was plenty of dresser & closet space. The only issue was the unusual shower lever, but once we figured it out, no problem. The parking lot ($20/day) was very convenient. The welcome package was a very nice touch. The Koa wood interior of this condo is gorgeous! The bed & furnishings are comfortable; the kitchen's well equipped, and the view is outstanding. The unit was very clean - which is a huge plus! There're several good restaurants within a short walk, including a McDonald's for breakfast & coffee. One of the singular attributes about this property is the parking - good access, plentiful, and well laid out. If we return to Honolulu, this is the place we'd prefer to stay. An excellent apartment in a great location near shops, restaurants, beaches and transport. Most tourist requirements are easily accessed by walking or the trolley/bus service. The condo is clean and quiet, the beds comfortable and the 180 degree view breathtaking. The kitchen was well set up and the condo contained all the essentials including beach towels. The booking process was simple and efficient and the welcoming basket appreciated.Highly Recommended. This was our second vacation to Oahu in the past 3 years and we have stayed at Ilikai marina both times. We love the convenient location and the views are wonderful. This was our first stay in Condo #1294 and we loved it! The condo was beautifully decorated and we had everything we needed for the stay. Being an end unit it was quiet and the views were great,especially the friday night fireworks at the Hilton lagoon. The rental process was smooth and all needed info was provided by Aloha Condos prior to us leaving home. I would not hesitate to rent this condo on a return trip to Oahu. Also a big thanks for the welcome basket of coffee, chocolates, and chips! Mahalo! This was our second vacation to Oahu in the past 3 years and we have stayed at Ilikai marina both times. We love the convenient location and the views are wonderful. This was our first stay in Condo #1294 and we loved it! The condo was beautifully decorated and we had everything we needed for the stay. Being an end unit it was quiet and the views were great,especially the friday night fireworks at the Hilton lagoon. The rental process was smooth and all needed info was provided by Aloha Condos prior to us leaving home. I would not hesitate to rent this condo on a return trip to Oahu. Also a big thanks for the welcome basket of coffee, chocolates, and chips! Beautifully appointed and great location! This is great condo if you love to be around the boats, watch the action or take a walk or jog at the ocean front park. Situated above Ala Wai Harbor the 180 degree vista gives you a great views of the boat action, waves and surfers. There's great restaurants just downstairs and plenty more within walking distance. Ala Moana Mall is also within walking distance, as well as the famous Waikiki beach. The condo is beautifully decorated with tropical décor and freshly updated bathroom and kitchen. You'll have all the kitchen necessities, flat screen TVs in the living room and bedroom, and there is a parking garage on premises if you have a car. Very comfortable and convenient, we'd stay here again !! Beautifully Decorated with Great Views!! Fantastic location with lots of amenities. Great views of marina and ocean! We could not be happier with this condo! The kitchen is all updated with a granite counter top and all the stainless items. The bed and the sofa bed are very comfortable to sleep. One of the things we appreciate is that there are tons of drawers for each person to put their own personal things. The view is breathtaking all through the day. We even had a chance to see a double rainbow!! The owner/contact person always responded to my inquiry promptly. We rented a car for 6 days. The parking fee is $20 a day for condo resident. But the location is great, you can actually walk to anywhere from the condo. We highly recommend this condo to anyone who are looking for a condo. Actually we will definitely come back here soon. 180 degree view of the Pacific Ocean, breathtaking views everywhere. Five minute walk to the largest mall in Oahu, the Ala Moana Shopping Ctr. Clean updated condo, has everything you need. Although I would recommend a modern blender for smoothies.The fridge is very nice, had filtered water and ice machine built in. This was a great bonus as it was so hot in Waikiki during our stay. The air conditioner worked great and kept us cool in the condo.I would also recommend that the owner include beach stuff like the other condo had where we stayed the previous days. Recommend,beach chairs, mats and a boogie board, also a cooler would be nice for the beach. Over-all a comfortable stay. Everything met our expectations. We only had one small issue with the wifi but it was dealt with quickly. The koa decor is gorgeous and about as Hawaiian as one can expect! The location is what originally drew us to this property and continues to not disappoint. We especially liked the snack basket! What a nice touch! This will definitely be the first unit we try and secure the next time our travels take us to O'ahu. We really enjoyed our two nights at Ilikai Marina 1294. The view from the unit is great- I even saw a whale breaching! I appreciated all the little details the owners/managers have thought to include like welcome snacks and body wash, shampoo, and conditioner in the bathroom (and not the no name brands you normally get staying in a hotel). We liked staying on the edge of town, away from the noise and hustle and bustle of Waikiki but we also liked that it was close by enough to walk in at night for dinner. For some reason I thought the property had a pool and it looks like the building we were in used to be able to use the pool at the hotel next door, but not any more. It wasn't a big deal though as the ocean water was as warm as a pool anyway! Mahalo for sharing your beautiful "home away from home"! Perfectly appointed, extremely comfortable and gorgeous Hawaiian décor made for a beautiful place to stay. This end unit provided stunning, ocean front panoramic views from Diamond Head to ala Moana Park. Friday night fireworks from the lanai were an extra treat! An easy walk to ala Moana Mall or Waikiki. A very enjoyable facility in all ways. This lovely condo had all the amenities we would want while visiting Honolulu. It was convenient to beaches, shopping, dining out: all within reasonable walking distance. A lovely touch was the welcoming basket. The condo was clean, neat, comfortable, and quiet. One minor complaint was the amount of dust in the living room area. When we inspected the source, we found the problem originating from the "fresh air upright fans" on either side of the TV. The grills or slats were thick with dust, front and back. It appears they are not vacuumed or dusted, thus they blow dust out. We would be happy to stay here again! We had a great time in your condo it Ilikai Marina. The location was great and easy to walk to almost everything we wanted to see. Only things that I would have added to help with the condo's amenities would have been some chairs for the lanai as well as maybe a couple of sand chairs, floaties, boogie boards or something like that that retnters could use. I bought an air matress while we were there and left it in the condo for future renters. Womens Retreat... at the Ilikai Marina! The Condo was spotless, and was everything we had hoped for. It was exactly as advertised. Good location, great views and magical sunsets. Renting this condo was easy and the staff who run aloha Condo's are very professional you don't have to worry about anything. You even get an email from the owners asking you to call them if there are any questions or problems. I did a huge amount of research before booking this condo. My mind was set at ease when I spoke to Chuck. The condo is as pictured and they do a very nice job of keeping it clean. The bed is really comfortable and you sleep very soundly. The noise from the harbor is almost nonexistent. The view from the 12th floor is very beautiful to wake up to. I wish they would clean up the harbor it was a bit trashy. Ladies there is more than enough closet and drawer space for all of your items. We were 3 women in the condo and still did not use all of the drawers. The Jacuzzi tub is nice to relax in. But be careful since it is deeper than a normal tub and requires some getting used to, to get yourself up and out, not much to hang onto. WiFi is easy to access. There are some extra's in the cabinet above the vanity we discovered a few days into our stay, like sunscreen, nail polish remover and hairspray. We were left a very nice "Welcome" basket to get our vacation started. Everything worked well and you have everything you need for a complete relaxing vacation. If you choose to stay here #1294 you wont be sorry. This condo is solid and so are the people you will have contact with. It was exquisite and much enjoyed when we were there for our Daughter's wedding. Plan to stay on our return visits and hopefully it is available. My husband, daughter and I enjoyed our ten day stay in Condo 1294. This corner condo was quiet with a great ocean view. The view from our lanai also allowed us to watch the boats in the marina, the surfers beyond the marina, as well as the nearby beach. We had the perfect seat to watch the fireworks from the Hilton on Friday nights. There was plenty of room for all our clothes (no living out of a suitcase). It was our first time to Hawaii and the Llikai Marina was a great place to stay. The room was clean and had a beautiful view. Walking distance to all the shops and restaurants. This condo was more than we expected. It was spotless and finely appointed. The bed was very comfortable. We didn't prepare food there because there are ample restaurants within walkong distance but the kitchen was well stocked. The lagoon and Waikiki beach are a very easy walk away. But it is just far enough away that you don't get bothered by the throngs of people on the beach. The best part of our stay was the view. Between the bedroom window and the very large slider leading to the balcony, you get an amazing view of not only the marina, but of the coastline as well. We will never bother with the Waikiki resorts again. Ilikai Marina is the better option. Location was great. Room was comfortable and clean. Our stay was excellent. Stayed for four days and truly enjoyed the location of this condo. Very well stocked and maintained. Felt like home! Close walk to beach and ala Moana Mall. The only bummer was the parking being 20.00 per day, but well kept garage. We rented a one bedroom unit for my husband, myself and 2 children and it was comfortable enough. The children had to sleep on a pull out couch and they did not complain about it at all. The room was clean except for inside some of the dresser drawers there were tags from the previous renters in the drawers so we did not unpack our clothing which was a pain! The carpet needed to be vacuumed as well, but other than that we were happy with the room. Not much of an entrance into the building which other condo's have and the halls had odors. Chuck was very easy to deal wirh and professional. Everything was exactly as advertised. Mahalo Chuck! I appreciated the service in regard to the emails with all the necessary information to arrive at our room. The condo was awesome, clean and comfortable for our family of four. We had a great week. Thank you! This was a first trip to Hawaii and because I'm not a big city person I wanted to stay in a "home" vs hotel. #1294 gave me this. The unit has everything you need to make yourself at home and you are close enough to shopping, Waikiki beach, the hop on hop off bus and restaurants if you want to go out to eat. The unit is quiet and comfortably furnished - I felt safe knowing that there was security at the building.Thank you ..... I have recommended this unit to my family and friends. My wife and I stayed in this condo after our wedding and absolutely loved it. The location was extremely convenient and we loved being close to tons of great restaurants and being able to watch the fireworks at the Hilton from our balcony at the condo. The condo itself was immaculate and well appointed. We had the bar fully stocked and its great for enjoying time with friends or family. Natalie responded to questions we had quickly and was very friendly. We were extremely comfortable and loved every minute of our stay. We were ready to sell our house and put an offer in on this guy! Book now! You won't regret it! My husband and I stayed here for 7 days for our honeymoon. It was absolutly wonderful. The room is equipped with everything you could need. The view at sunset is breath taking. I have a picture of every sunset from the patio. The patiois the only downside to this lovely room. Its very small. My husband and I sat cross legged with no room to spare. But still beautiful none the less. The bed is very comfortable & has a flat screen tv although the big window looking out at the sea was all we needed. I loved the bathtub it had jets which were wonderful after a full day of activities. The location is awesome. Close to everything. If you opt out of renting a car the bus lines are very close. We didn't miss not having a car. We had the pleasure of meeting Natalie who takes care of the place. She was so extremely nice and welcoming. Gave us tons of info on best happy hours and places to eat. She was even able to be contacted for simple questions which is nice if your unfamiliar of the area. There are numerous bars and resturants all within walking distance. Chart House located in the same building is amazing for drinks and steak. The room is very quiet, clean and roomy. The welcome basket of goodies was the perfect touch. I would highly recommend this place to everyone looking for a wonderful condo to stay. A beautiful view, a welcome basket of local edibles and a location in Waikiki that made walking to the zoo or ala Moana Center a breeze. Towels were big and thick. Kitchen was remodeled and cabinets looked like Koa wood. Beautiful!In order to hit the excellent star, more practical amenities would have been nice. There was no overhead lighting in the hallway and the vanity lighting wasn't adequate. In the bathroom, as an alternative to a canvas hamper and extra towel racks, they might consider more counter space/toiletry storage and add decorative hooks for hanging towels instead. Long term, is the pocket door really necessary? Making that a wall would add considerable space to the bathroom for storage needs. Likewise, even though the kitchen looked stellar, it wasn't very functional as it had very limited counter space. With no dishwasher, and after washing dishes, there was even less counter space. The floating island seemed disjointed. Service was first rate however, as they were willing and able to accomodate our early arrival of luggage. We left our packed luggage in the closets and enjoyed our day! We would most certainly return here and recommend this unit to friends! My husband and 2 sons stayed in 1294 for ten nights over the holidays.We loved the location and the view. The condo itself was in great condition. Upgraded kitchen with everything we needed and upgraded bathroom. Convenient parking also available for our car rental. We've stayed in the same building before but without the upgrades; what a difference a new kitchen and bathroom makes! The condo was quiet, super clean and just the right amount of space for the 4 of us. Having the aBC store on the corner was a great benefit too. We truly enjoyed our stay and look forward to coming back next year. We would diffently stay here again. This room with a great view, to stay in Honolulu was also a very convenient location. Stay for the weekend, I was able to enjoy the fireworks from the Hilton, I said that view was not sorry about your stay at the Hilton. Perfect location with very comfortable accommodations. The location of this property is within walking distance of everything that you want or need in Waikiki. We were very comfortable and will be a repeat customer. You will not be unhappy staying here. We were very happy with our stay in this condo. It was very clean and had a wonderful balcony with have an Ocean View . My husband and I stayed here because we were the Best Man and Maid Of Honour in our good friends' wedding...at the Hilton Hawaiian Village, which is very close. We decided to stay in a condo because we loved the idea of having a kitchen and a little more space. We weren't disappointed. Instructions for check-in were detailed and easy to follow...we had no problems finding the place or getting accesss. We found the location of the condo to be amazing...close to absolutely everything; restaurants of all kinds from McDonalds and Red Lobster to Kobe's. An easy walk to anything you could possibly need, like shopping or groceries, or a very affordable cab ride elsewhere. The condo itself was great too, with a big comfortable bed and fully stocked kitchen. Amazing views of the marina and ocean, very quiet(even with the lanai doors open you can barely hear the traffic), and private. We would definitely recommend this unit to anyone considering staying here. Also must try the Harbor Pub right downstairs for great pizzas, really cheap drinks and great service too! Beautiful views, clean and comfortable! We would highly recommend this unit. It was clean, comfortable and had all ammenities needed for a small family to stay comfortably. Will definitely stay again in future. We stayed at this condo for 5 nights. The layout of the condo is very practical, the king bed was very comfortable. Our children slept on the Sofa Bed and said it was not very comfortable. I think this is a good condo for 2 people. The location is pretty good. The service was excellent, we had an issue with the Internet and it was resolved within a day of reporting it. Ah, what a great condo! Wonderful view out over the Marina, just a short stroll to Hilton Hawaiian Village and beyond that the whole crazy strip, easy parking, quiet. My wife and I stayed here 4 nights and agreed it was the best place we've stayed in 4-5 trips to Oahu so far. The furnishings and decor are good quality and island-appropriate, with nice koa wood cabinetry in the kitchen. The kitchen was well-stocked with appliances and dishes, the bed was comfortable and king-sized, the bathroom was plenty adequate, etc. The building is an easy 10-minute walk to the Hawaii Convention Center, where I was attending a meeting. The only improvement I'd make is to put a more room-darkening shade over the bedroom window; the marina lights and the full moon made the room pretty bright and I found it hard to stay asleep until I tried an eye mask. Otherwise, no complaints! This condo is very convenient to the convention center and ala Moana Shopping Center and a comfortable walk to Waikiki along the beachfront. We could not find any good restaurants in the area, however, just chains or over-priced beachfront dives. The condos furnishings are OK in the bedroom, however, the living room sofa is broken-down and uncomfortable to sit on for TV watching. There are very limited kitchen utensils. Probably the biggest negative is lack of adequate lighting in the entire condo. We could not read in bed because the lighting is so poor. We had to turn on every light in the kitchen, living room, and dining room to have more than a dim view in the condo at night. Finally, we have never stayed in a condo where the owner did not provide a single bar of soap. The first morning, I had to walk to the aBC on the corner to buy a bar of soap for our morning showers! We were generally disappointed in this condo. Deb, it sounds like you weren’t very happy and we’re sorry you couldn’t find a good restaurant in the Waikiki area. Our guests are provided with bar soap and liquid hand soap with extra supplies in the cabinet under the lavatory. Your instructions included local contact information, and you were invited to give us a call if you experienced any difficulty during your visit. I regret you didn’t give us that opportunity as we would have been happy to respond to your requests and improve the quality of your stay. We stayed a week in eary March 2012. The weather was far less than ideal, but the condo was excellent. The interior is elegant and the view is fantastic. Make sure to enjoy the great fireworks show every Friday and maybe Thursdays also. Balcony is perfect viewing. Condo was clean and comfortable. Check in is easy. My mother rented this condo for us for our honeymoon and as we had never stayed in a condo before or even been to Hawaii we didn't know what to expect. When we walked in the room it was late at night and the room looked wonderful when we opened the door and the welcome basket was very unexpected but a lovely touch. I have to say the room is very tastefully decorated and has every amenity you could ever want including a jetted tub which my wife made immediate use of. The furniture is of the highest quality and the bed was extremely confortable. When we opened the curtains the next morning the view took our breath away and just added the cherry on top of the cake. It was a treat to sit and watch the boats come and go in the marina and to watch the numerous dragon boats come and go as they practiced out in the ocean. We were thrilled with this condo and would definitely rent it again and recommend it to everyone we meet. It made our honeymoon complete and thank you Chuck for letting us enjoy it. Loved the location of condo. Upgrades in condo were nice. Bad things: airconditioner works so poorly as to make condo almost unbearable in the evening hours, especially since the roll up blind for the sliding glass doors is totally broken- the blind has torn off from the roller part of the blind. The sun heats up the apt alot and makes evening sleep rather difficult. I apologize for the blinds and they have been repaired. As I mentioned to you in our last correspondence, the windows have a “lock-out” system to prevent the AC from cooling if not tightly closed. At any rate we are having the AC checked to be sure it is functioning properly. We provide all of our guests with a local contact phone number to call for assistance during their visit. Glad you liked the location and upgrades and I hope you will return. Thank you! it was more than what we expected. it was our first time to stay at condo in Hawaii. Since we were traveling one year old child, we needed somewhere we could feel like living at home. there was everything we needed. it was perfect for our holiday in Hawaii. we would definitely recommend it. 6 stars! Over the years I have stayed in most of the hotels and lots of condos in Waikiki and Chuck provides the best. I arrived a day early and Natalie buffed the room out on her Sunday afternoon for me. This property is a 5 minute walk from major shopping and the heart of Waikiki beach and night life but out of the traffic and noise. The photos on the website seem too good to be true but believe it! Price compare it to hotels with "mountain view" and this is ocean front. You can't get any closer. Full kitchen, great towels, full a/V in bedroom and common area with free hot spot and very nicely furnished. Lots of extras in the closet for kids and adults at the beach. Parking isn't cheap ($17/day) but there were always spaces and it is half of the going rate at hotels. $8 airport shuttle from the Ilikai concierge. If I owned this condo, I wouldn't change a thing. I will ask for 1294 every time I come to Oahu. We vacationed with our 2 month old baby, who we had sleeping in the living room. This condo is in a great location close to the Marina and walking distance to all the resorts. It was well appointed and clean. The building was quiet. The hallway outside had a strange odor and was a bit dingy, but none of this came through to the condo. We would definitely stay here again. The condo was well looked after, clean on arrival with a mid stay clean. At the end of Waikiki so in a nice quiet spot but still close enough to everything if you wanted. It was expensive but then it seems Hawaii is so cheap wasn't really an option and you made up for it by being able to cook for yourself a few nights a week. It was however on top of one of The Chart House, a great spot for eating, drinking and watching the sun set. Perfect location and lay-out, excellent amenities! It was an easy walk to Wakiki beach with the provided beach chairs/mats/towels. Loved looking out over the marina! The aBC Store was so convenient for groceries. The ala Moana Mall was within walking distance; we stopped there to pick up another pair of shorts and had dinner at the food court - inexpensive but good food. We opted not to rent a car on Oahu, and took the bus everywhere we wanted to go. The bus stop was right at the corner across from the aBC Store. It may have taken a bit longer to get places, but was interesting and a lot less expensive. We only had 3 days, but went to the USS arizona Memorial and the USS Missouri Memorial at Pearl Harbor, went to Diamond Head, and went snorkeling at Hanauma Bay, and spent time on Wakiki beach. Ilikai Marina Condo 1294 was a perfect location, very well maintained and had all the amenities we needed! And we loved the welcoming gift basket! The condo was great. Walking distance to many, many places. We rented an SUV and saw the whole island. Was lucky enough to enjoy the opening of Morimoto restaurant next door. Fantastic food and ambiance! Experienced a luau, North Shore, shrimp truck, Turtle Bay, Waikiki Beach, Polynesian Cultural Center, Pineapple Express, and many more. The condo had a wonderful view of the marina with the ocean in the background. Beautiful sunsets from the balcony every night. Great location, close to everything. Lot of it walking distance. Very quiet. Chuck Buser was a gem in coordinating everything from the rental to getting us information on a wheelchair delivery. Hawaiian Medical had a chair waiting in our room when we arrived and picked it up the day we left. Nice laundry facilities and building itself was very clean. David, the office manager was most helpful and friendly. The public parking attendant at the condo was equally as nice. Very convenient to Waikiki, shopping at ala Moana Shopping Mall and dining. The parking garage was very convenient and easily accessed. The unit had a beautiful view, was clean and nicely decorated. The welcome basket of goodies was appreciated. Great a/C! We enjoyed a wonderful stay in 1294. The only area of malfunction during our stay was the toilet. The issue did not significantly affect our stay. The property manager advised on our arrival that the toilet required maintenance...this was schedule for during our stay but was not undertaken. We had a wonderful 8 day stay at the Illikai marina. The location was perfect for a family with young children. The condo was clean and very nicely decorated. We stay in alot of vacation condos and location alone will keep us coming back to the illikai marina. Unfortunately there are some caveats.1. Even though we asked the aloha condos staff about the deck railings looking like they ended awfully far from the building, they assured us the spacing was no more then the railing spacing.. that was incorrect. *IF* you had the condo slider open all the way blocking off 2 inches, that was true. If you closed the slider part way then the spacing was 8 inches! Not only that, but there is a small ledge, so I would never recommend leaving the slider open with children under 8-10. I cant comprehend how it could have ever met building codes. Now, saying that, we would still stay there again because we love the location and the a/c works great. :) But we would have brought a travel gate so that we could feel safe opening the sliding door. 2. The kitchen didnt have a stitch of tupperware -none of the perks that you usually find in a rental... sugar, or left over foil that the last folks left bring those from home. 3. Towels!! We (3) were provided with 1 bath towel and 1 beach towel for an 8 day stay. I dont know about you, but I dont use the same towel every day for over a week.. especially when vacationing in a beach location that is very warm. We had to wash the towels, which was a first at any rental we have ever stayed in. The washer and dryers at the illikai ate $5 in quarters. There is no change machine. ABC store will only give 3.00 in quarters with purchase. It was a big pain. Dont use the stacked w/d & bring plenty of quarters. It cost 2.25 each load to wash and an addtl 2.25 to dry. The washer only fit 6 of the large towels and a few hand towels. Again, we would stay there again and feel it was a value, but wish we would have known the above. We loved our stay at 1294 at the Illikai Condo. It was clean, tidy and very quiet. It had a kitchen which was fully equipped if you wanted to stay in and cook. Otherwise there was a Red Lobster down stairs, pub and other places within walking distance. Great location which was a 10 min walk to Waikiki beach so you weren't in the hussle and bussle. It also was 10min walk to Ala Mona shopping centre which had fantastic stores. There was cheap parking for $6US for 12hrs which is great if you had a car for a few days. We parked at the condo's which was $17US per day and worked out better for us as we didn't have to keep moving the car after 12hrs. The only downside is that there was construction work happening at the Ilikai Hotel across the road so could be a bit noisy in the day, however if your in Hawaii you wouldn't really be staying in your room! Would definately stay here again and recommend it to family and friends. So much like home - it was tempting to stay longer! This condo is the perfect size with the perfect amenities! And quiet, save for the fireworks on Friday night of which I had a fantastic view. It was comfortable and clean and close to a lot of things - mall, quaint shops, restaurants, beach, etc. Finally, the owner is very prompt in his responses when you have questions - I really liked working with him as well. And, by the way, the candy, nuts, and coffee on arrival were nice touches! Thanks, and I will definitely stay there again, should the opportunity arise. My family and I stayed in unit 1294 for 9 days on a recent trip to O'ahu. The condo was perfect for us! My husband was attending a conference at the Hilton Hawaiian Village just two hotels down from us- less than a 10 minute walk. From the Ilikai Marina I could walk with our 14 month old to the beach, to the lagoon, to the Ala Moana Mall (where there's also a full grocery store), or take a longer walk down into the "heart" of Waikiki. It was also a convenient starting point for driving to other parts of the island, like the North Shore and to Hanauma Bay. The condo itself had everything we needed and we loved having a full kitchen. The view from the condo is fantastic and on our last morning we were treated to a gorgeous full rainbow just outside. The bed was comfy, the air conditioning worked great, it was easy to park and easy to make all the arrangements with Chuck, the property manager. We rented baby equipment like a high chair and pack-n-play from a local company called www.babytravelmadeeasy.com. They provided a great service. The only drawback to the condo is there is no dishwasher. Since we did a lot of cooking ourselves, this was one convenience that would have been nice to have. Also one of the standing lamps in the living room had a burnt out bulb and the toilet tank seemed to have a leak so the water would run more than it needed to. We used the washer and dryer in the building twice during our stay and that was really nice to have nearby. Great place to stay with a very nice view of the ocean. The condo was picked up and sort of clean. There were food scraps in the kitchen sink, the refrigerator was not wiped down, the kitchen had been swept, but the dustpan was not used to complete the task, the windows toward the extraordinary view were not clean, the glass top tables and furniture were dusty, there were visible dust clusters under the bed, and there was an empty candy wrapper on the bed.I called the owner within minutes to let him know the condition. I also called the individual in charge of cleaning. She did come a few hours later, and cleaned the sink and floor. I paid a $120.00 cleaning fee, and asked that the fee be reduced or waived. The owner did not call back either that evening or during the following 3 days. When my family and I arrived at the Ilikai Marina, we were surprised at how close it was to so many sites. We were within walking distance of Waikiki Beach, Ala Moana Mall and Park. We had a great view of the marina and a beautiful sunset every night. The room had enough room for the four of us and amenities like a kitchenette stocked with dishes and appliances, a bathtub with a jacuzzi, two TV's with cable, and a sofa bed for the kids. It was a great central location to all the places we wanted to see. We had a blast. The only thing I could not figure out was how to turn on the showerhead, but the jacuzzi made up for that. After a long day of sightseeing, the warm jets of water soothed my sore muscles and helped me relax on my vacation. We found the room to be very pleasant, with great views of the Ocean and Marina. The location is perfect with the heart of Waikiki, the Ala Moana Mall, and the Convention Centre all within a very short stroll! Fanastic location and view, walking distance to Waikiki. Very quiet. We didn't eat in, so lack of dishwasher was only a minor inconnvenience to us. This place was fantastic!! Everything we expected and more. Very Clean. Great View. Convenient to all. Chuck @ Aloha rentals was also great to deal with. He had great follow up on everything from start to finish. This unit made our vacation to Oahu even more enjoyable and having breakfast every morning overlooking such a wonderful view, made it very difficult to leave. We needed a place close to a relative's apartment with easy access and near-by parking. The location was exactly what we were looking for and parking couldn't have been easier. We could walk out the door of the apartment, take the elevator, and be in the parking garage in less than five minutes. The view of the marina was delightful. The apartment was well furnished, the bed was comfortable, and the kitchen seemed stocked with all the plates, cups, glasses, and flatware anyone would need. It met our needs exactly. This was a great place to stay, if you want an ocean view, with a full kitchen without paying for an overpriced hotel. Really enjoyed our week at this condo. Close to main streets, ocean, restaurants and shops, but quiet. We discovered a gem of an accomodation! My wife and I have been coming to Oahu for every 40 years. We usually stay in hotels or with friends. For many years our parents rented condos at the Ilikai Marina. We looked for a gem and we found it. Great view, beautifully appointed accomodation exactly as depicted in the internet video, and the location inspires exploring Ala Moana and the Waikiki area on foot. We are definitely returning to this unit! My family experienced the magic of Hawai'i at Christmas and New Year's from this waterfront condo in Honolulu. The condo was in exceptional condition, and the service was first rate. All of our questions were answered with speed and curtesy, and basic needs were anticipated without our asking! From the great views, to the great accomodations, we could not have asked for a more perfect vacation. Mahalo to Aloha Condos! Cons:- Would be really nice to have a kettle.- No full-length mirror.- No shampoo/Linse/body wash (some condos supply these amenities)- There was no welcome gifts/snacks (that was in the condo the last time we rented).- Dish-washing sponge was too dirty and old to be useful ( I would use that sponge to do my dishes at home)- There was only a little bath cleaner.- There was no medium-size towel that was there the last time.- No dish washer.- Could have used another set of bed sheets. Condo was not cleaned from previous occupant and had to call for service. Also, garage charged for 4, 24hr. periods when we checked in after 11am on the 1st and had to be out by 11am on the 4th. The sign posted at the gate clearly states per 24hr period. Would also have liked a lanai large enough to enjoy sitting on and a pool! Location was great and condo itself was otherwise comfortable, MUCH better than unit 394 which rents for same rate. Also liked the convenient check-in procedures. As much/as little stimulation as you want! The condo is very tastefully decorated and the view is spectacular. We especially enjoyed watching the sunset from our lanai overlooking the ocean. The Ilikai is located within walking distance of Waikiki Beach to the south and Ala Moana shopping mall to the north. Next year will be our 3rd year returning to this beautiful location - the condo has such a warm homey feeling, just perfect for the two of us! The condo was better than advertised. Great accommodation, close to the water and a view to forever. Appliances were just like home and easy to use. The little extras were great for beach use and even a printer for the laptop.I would do it again.